It’s an exciting year for the gardening world, with ‘outdoor living’ tipped to continue to be a big trend. This trend, which sees homeowners separating areas of outdoor space into ‘rooms’ for relaxing, eating, and entertaining, is easy to create with the help of a few well-placed decorative garden structures. 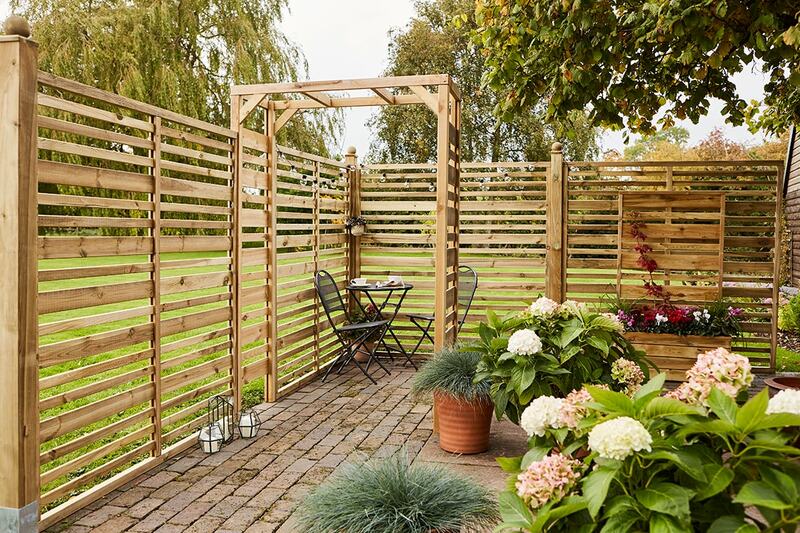 Great for those wanting to experiment, we offer stylishly coordinated garden pieces and fence panels, which can be used to achieve the outdoor room look, even in small gardens. For compact spaces, the Urban collection includes a minimalistic slatted Urban Garden Arch, Urban Garden Pergola and Urban Garden Screen which is ideal for breaking up space without being too overbearing. When used in combination, the Urban range creates an interesting, progressive outdoor living space, perfect for city dwellers. For those who fear they may lack the necessary privacy to enjoy the outdoor living trend to its full potential, we introduced a robust new Fence Panel to the market in 2017. The Contemporary Vogue Panel benefits from slats on both sides of the frame for absolute privacy. With the added appeal of a seriously elegant design and smooth finish, this premium Panel can be used alongside the Contemporary Garden Arch, Contemporary Arbour and Contemporary Planters for a chic alternative to traditional garden furniture. As a company, we regularly carry out interesting research into current lifestyle habits. It seems we’re all wanting to make the most of the outside space available to us, with clever, functional products to help maximise usability. This is exactly what we have tried to achieve with the introduction of products such as our Urban range and the more substantial Contemporary Vogue Panel. We hope that this year, Grange is able to inspire even more homeowners to experiment with the outdoor living trend in their own back garden! Visit our Garden Trends page to keep up to date with the latest trends.